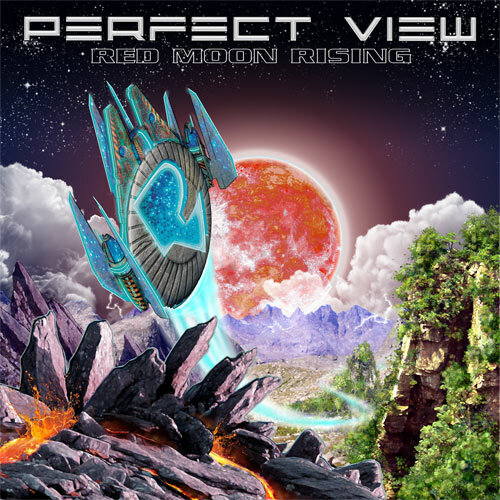 Rocktopia - PERFECT VIEW will be back in May with "Red Moon Rising"
PERFECT VIEW will be back in May with "Red Moon Rising"
The Italian Melodic Rock band PERFECT VIEW will release their second album “Red Moon Rising” on May 23rd 2014 through Avenue Of Allies. Almost four years have passed since the five-piece from Modena released their acclaimed debut album “Hold Your Dreams” in the fall of 2010 and the development of the band since then is nothing short of impressive. While the first record was a very good sounding and solid effort, it still tested the waters of a variety of Hard and Heavy genres, from AOR to Progressive Hard Rock. The songs “Red Moon Rising” are now very focused and it’s clear that Melodic Rock with a slightly harder edge is what the band does best. As expected the songs are again on a consistently high level regarding the song writing, the arrangements and the flawless performance of each band member. PERFECT VIEW was founded in 2008 by singer Max Ordine, guitar player Francesco Cataldo and drummer Luca Ferraresi. Their idea for the musical direction of the band was to combine elements of first class AOR and Melodic Rock in the vein of Toto, Winger and Journey with some harder moments à la Van Halen and Lynch Mob and to add an occasional progressive touch to the sound. The line-up for “Hold Your Dreams” was completed by Cristian Guerzoni on bass and Pier Mazzini on keyboards. Prior to being a part of PERFECT VIEW the guys in the band have shown their musical talents on the stage, as well as in the studio when they were working with established artists and bands like Olaf Thorsen (Vision Divine, Labyrinth), Roberto Tiranti (Labyrinth), Alex DeRosso (Dokken, Dark Lord) and the very successful Kiss tribute band Electric Circus. Max and Francesco were also members of the band Xteria, a predecessor of PERFECT VIEW. Xteria recorded one album called "Outshine" in 2000 and they opened for the American Progressive Metal band Symphony X that same year. Since the release of their debut album the band shot a video for the title track of “Hold Your Dreams” and they also played a number of live shows, including an opening gig for Harem Scarem. In early 2012 Cristian left the band for personal reasons, he was replaced by Frank Paulis, an old road dog, who also took over various tasks on the band’s business side. The work on the songs for “Red Moon Rising” was again a collective effort with contributions coming from each musician, in addition to their own compositions the guys added Toto’s epic “Home Of The Brave” to the album’s tracklist. The recording sessions started in May 2013, with the tracks eventually being engineered and mixed in November by Roberto Priori (Danger Zone, Wheels Of Fire, Los Angeles) at his PriStudios in Bologna, Italy, together with Pier Mazzini. Some of the band’s musical friends make guest appearances on the album, Michele Luppi (Secret Sphere, Los Angeles, ex-Vision Divine) sings background and harmony vocals on the Melodic Rock anthem "By My Side" and Giacomo Gigantelli (Danger Zone) contributed to the background vocals on "Slave To The Empire". PERFECT VIEW have already scheduled some concerts and festival gigs for 2014 and the band will support the release of “Red Moon Rising” with special activities for the fans and of course with more live dates.